One of the signs that we are in the last days before Jesus returns is a proliferation of false teachers promoting false teachings (Matt. 24:24; Mk. 13:22). One of the most prolific of these false teachings today is the philosophy and practice of Yoga, the primary tool of Hindu missionaries to North America since Swami Vivekananda introduced yoga to the West at the 1893 World's Fair in Chicago. Yoga is one of the classic systems of Hindu philosophy that practices certain disciplines to achieve freedom from the limitations of the flesh and lead to the fulfillment of knowledge. But, what knowledge? If only Christians knew how occultic — how demonic — the "knowledge" gained by yoga truly is. Even the "harmless" exercise portion are in reality various ritual genuflects to Hindu idols. "Once in the class, I scanned the room, curious as to what type of people take yoga. The class was comprised of an unlikely bunch: hefty, construction crew-type men, white-haired grandmas, and people such as me, wearing Nikes and t-shirts. I didn't spot any lime-green hair, or a single pierced nose. Suddenly my attention was drawn to the front of the room. There she was, the instructor-a bit larger than I expected. She looked nothing like those leotard-clad yoga instructors on TV. Her wiry blonde hair blended with her wire-rimmed glasses, giving her an all-around bland appearance. She spoke softly but with intimidating authority. 'Take off your shoes and socks,' she said with a whisper. Reluctantly I removed them, hoping nobody else in the room could smell my feet. She explained that we needed to be barefoot so we could sink our feet into the earth. Funny, this earth looked a lot like carpet to me. But I complied, imagining my feet squishing into the soft, fertile ground. 'Now we need to get acquainted with our breath. Americans generally breathe through their mouths and miss the benefits of breathing fully,' she informed us. I forced the air in and out, trying to make friends with my breath. It felt good. 'Yoga is thousands of years old, and as of late, has been accepted by modern medicine as a remedy for back pain and stress reduction,' she said between breaths. Thousands of years old? Accepted by the medical community? It must be a good thing, I rationalized as I prepared to stretch. We moved quickly into what she termed poses. First I was a tree. Then she coaxed us into bending our limbs and planting our right foot onto our inner thigh. That wasn't all that difficult until she asked us to squat and twist our torso 90 degrees. She called it the 'twisted chair.' How appropriate. I looked like a pretzel in blue sweat pants. Next we began 'sun salutations.' With our hands raised over our heads, we quickly dropped them to our feet. Finally, we brought our entire bodies to the floor, prostrate. It was obvious this was an ancient form of sun worship. Now not only was my body contorting, my mind was too. God's first commandment to not have any other gods before him sprang to mind. I was getting uncomfortable. After several repetitions of sun salutations, she brought us back into 'mountain pose.' I glanced at the clock and was shocked to see all but five minutes of the hour-long class had slipped by. It was time for the relaxation exercise. My muscles were ready, but my spirit was a bit more cautious. I lay down on the carpeted earth. She encouraged us to shut our eyes and go to our quiet place. Being a mother of two boys, I wasn't sure if such a place existed, so I decided heaven would be my quiet place. 'It's time to let go of the stresses of the world, your job, your home, your deadlines, and just be at peace,' the instructor said soothingly. The twing-twang of the music seemed to blend with everyone's breathing. Then she instructed us to start squeezing the muscles in our toes, then our feet, on up our legs, abdomen, and finally our faces. What a sight we all must have been lying there, our bodies rigid and our faces forced into Jim Carrey-like contortions. 'Now fall back into the earth,' our instructor commanded. We repeated this bizarre exercise about three times, and then, the instructor told us to come back into our body. With some research under my belt, I'm sure many readers would be surprised to realize that the yoga postures are offerings to the 330 million Hindu gods (manifestations of Brahman). As you perform the yoga poses, you are in essence worshipping a false god(s). Note also from the Christianity Today article quoted above that the author mentions, "come back into our body?" Leaving our bodies and going to our quiet place? I wonder who checks in, while the yoga student checks out? Yoga means "union" or "yoked" in Sanskrit. "Union and yoked with what? ", you might ask. Well, as mentioned earlier, it is one of the ways of knowledge to become in union with Brahman. As yoga is an arm of Hinduism, its ultimate goal is to help you reach union with Brahman, your higher self, god, or the universe, depending on your interpretation of "god in us". The practice of yoga, the positions and breathing prepares the body for the occult changes that will arouse the coiled power (kundalini) at the base of spine. This power can travel up the spine passing through the chakras to the top of your head (Crown Chakra). It is the ultimate goal for the kundalini (Coiled or Serpent Power) to reach the brain. The "OM" which is repeated over and over again is to empty the mind of thought so that a new spirit can enter. I have personally heard reports and read documentation of yoga participants experiencing some or even all of the following as a result of their seemingly harmless "exercise" program: Fear, uncontrollable laughing or weeping, intervals of ecstasy, tremors, spasms, and violent shaking. In some cases the guru or instructor can impart these manifestations in mass, to his/her students, leaving them writhing on the floor helpless. A Christian should not and can not take part in something so distasteful to God whom we profess to love. Even if one removes the spiritual aspects of yoga (which evidence would suggest is impossible) and fools themselves into thinking it's only exercise, the truth of the matter is that regardless of your intent, to the outside world you look like you are condoning yoga — all aspects of it. Your actions could very well be a stumbling block to others and causing others to fall into the trap of occultism, new-ageism and idolatry. We are to abstain from those things which could make our brother stumble. We are to walk diligently in the world, but yet set apart from the world. We don't desire the things of this world, but rather the things of the heaven. In my opinion this would include those "Christian" alternatives to yoga which are popping up. True, they may not be actually yoga in concept and teaching, yet they still "look" like yoga to an outside and unbelieving world. If the world sees a Christian doing something that looks like yoga, they might therefore believe that yoga is safe and condoned by the church, thereby falling into a trap that leads to destruction. Yoga is everywhere. It's on television, it's being taught in church basements, at fitness centres and even in video games (a place Hinduism and new-age thinking likes to hide as well). The very popular video game Wii Fit contains elements of exercise that is very good for the fitness of an individual, unfortunately it is also packaged with a plethora of yoga stretches and poses to help obtain your fitness goals. Within the very city where I live there is a non-profit group called Yoga for Youth who's sole purpose is to get yoga into all of the public schools as a regular program5 — and it seems to be working. My kids report back to me the presence of yoga in their physical education classes. My kids of course abstain, and have so far been left un-harassed by their teachers, fellow students and school administration, but I wonder for how long? Many of the Christian parents we talk to, do not have any problems with their kids taking part in yoga at school — after all, it's just exercise right? I wonder how long before our family's voice will be deemed as one of an extreme minority whose petty intolerance to things condemned by the Bible is outdated, and unconstitutional. It's time for the Church to stand up, dust off their swords and be counted for truth and righteousness. Are we just going to continue to allow Satan to have a field day in our public schools and communities, or are we going to let our voice stand, and abstain from these types of activities and teachings? For every community group that promotes occult activities, the Church could raise up a valid and justified counter argument. However, it repeatedly remains silent. Perhaps if abstinence and letters of concern were sent in response to these types of programs, there would be far fewer of them permeating our society. I wonder if the same would hold true to the television programming and other media venues such as Hollywood? (A good subject for another article). We homeschool our five children, mom and I are very tough on what gets into our childrens brains through their eyes and ears. You raise good points about what other occultic satanic influences we let into our lives everydayin tv, movies, vid games, music, etc. I only pray daily that mom and I are diligent and faithful to our Lord...it is such a task raising kids in this world today. We should pray for one another as parents and grandparents, it is a different world than when I was a wee lad in the 60's and 70's. ps. for hartdawg if you see this. In answer to your question of why I stay anon. One word....plausible deniablilty :). hartdawg, Just kidding with the above, I would be proud to stand next to the brothers and sisters here...the real answer is more accurately my paranoia about having so much info out there about me. I know it's crazy but I am not keen on giving out my e-mail or real name etc to register for websites. Fight The Good fight my dear friend!! 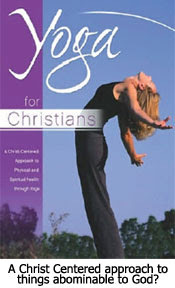 Let no Christian friends in US be fooled to think its only exercise - NO -Yoga is clearly a branch of Hinduism! Please warn all christians to avoid it! !